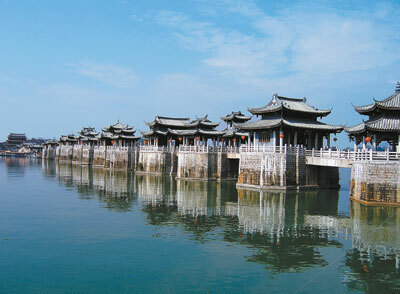 CHAOZHOU is one of the most historic and cultural cities in Guangdong Province. Situated in the eastern part of the province along the coast, it is now a medium-sized city with a population of about 2.5 million people. There are mountains around the area, and hundreds of scenic areas such as ancient walls, temples, bridges and pagodas with their unique Chaozhou styles. So why not take several days off and experience a historical and relaxing holiday here with some friends and families? Guangji Bridge in Chaozhou, along with Zhaozhou Bridge in Hebei Province, Luoyang Bridge in Fujian Province and Lugou Bridge in Beijing, are considered the four most famous bridges in ancient China. On one side of the bridge is a stone tablet inscribed with four Chinese characters that read: Flood Stops Here. Legend says that the inscription was written by Han Xiangzi, one of the Eight Immortals. Therefore, the bridge also has another name, Xiangzi Bridge. The construction of the bridge began in 1170 in the Southern Song Dynasty (1127-1279) and lasted 57 years. With a length of 520 meters, the bridge has 18 piers in the east and west sections, and the middle section of the bridge runs 100 meters long. More piers were built in 1435 during the Ming Dynasty (1368-1644). In 1638, it caught fire and all the bridge’s pavilions were burnt down. The piers are precious relics of Chinese architecture. The middle section of the bridge was rebuilt to be supported by 18 shuttle boats that allowed the structure to open and close. It is the first big stone bridge in China to be equipped with such a feature. In 1958, the shuttle boats were dismantled due to traffic needs and a straight bridge was rebuilt in its place. The bridge connects a temple which was built to commemorate Han Yu (768-824), a well-known scholar, writer and philosopher in the Tang Dynasty (618-907). Although Han had governed the area for only eight months, he had won the respect of the local people, helping them to understand the importance of reading and learning. The 800-year-old temple is the oldest and the best-preserved temple for Han in China, and is also one of the eight sceneries in Chaozhou. Many local people like to pay visits to the temple before having major examinations. Taiping Road in Chaozhou is also known as Paifang Street (Memorial Arch Street) because of the 20 historic memorial arches lined along the street. According to historical files, there were about 180 ancient memorial arches of different kinds in Chaozhou, and 105 were built in the downtown area. As Taiping Road was the main road in ancient Chaozhou, 39 ancient arches used to stand along the road. Most of the arches were rebuilt in 2009. The 22 arches which still stand include an arch to commemorate the “No. 1 scholar” Lin Daqin (1511-1545) and an arch built by Weng Wanda (1498-1552), a high-ranking official in the Ming Dynasty. The street is also a hub for Chaozhou specialties, including the well-known Chaozhou snacks and Chaozhou opera. Visitors to the street can also find traditional handicrafts such as wood carvings and embroidery. Chaozhou is home to many Chinese who have returned to China from overseas, so the architecture in the area also reflects a number of exotic influences. Transport: Drive from Shenzhen to Chaozhou via Nanguang Expressway, Longda Expressway, Hugang Expressway and Chaoguan Expressway. You can also take long-distance coaches at Luohu Bus Station, Qiaoshe Bus Station and Futian Bus Station.